It's here. 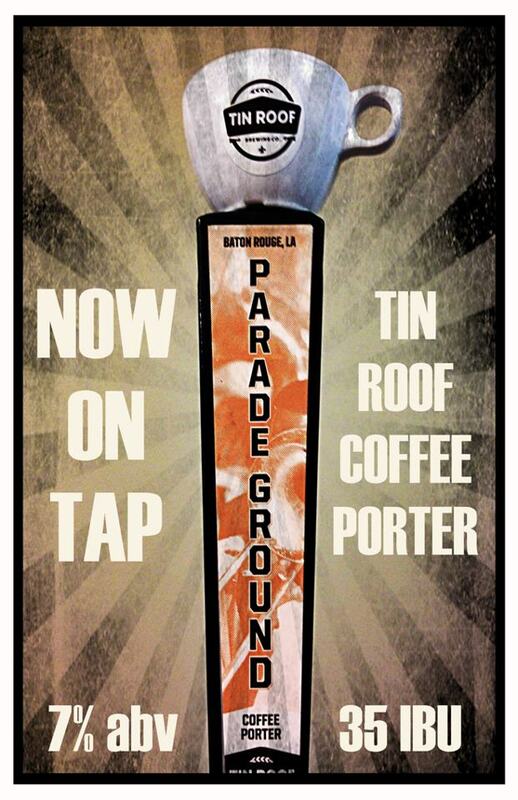 With the debut at Happy's Irish Pub downtown and the Bulldog on Perkins this past Tuesday followed by stops in New Orleans and at The Barley Oak on the Northshore, Tin Roof has now officially launched their first fall seasonal: The Parade Ground Coffee Porter. The Parade Ground is a ode to the iconic field on LSU's campus, Louisiana's parading culture, and the grinding of coffee beans. It is a dark, rich beer with plenty of coffee in the aroma. On taste it contains a pleasant coffee bite that warms your mouth with enough balance from the malts to prevent any unwelcome bitterness, though the coffee and hops are most certainly present. The beer is best enjoyed chilled, but certainly not ice cold, so please do yourself a favor and alert any unknowing bartender that you'd like a non-frosted glass. If you get a chance, do a little beer education while you're at it. 32 degrees is not the ideal drinking temperature of good beer. Try it in the low 50s for maximum flavor and palate pleasing effects! The Parade Ground Porter is the fifth official beer to come out of Tin Roof, following their flagship brands of Perfect Tin Amber Ale, Voodoo Bengal Specialty Pale Ale, Bandit Blonde Ale, and this past summer's Watermelon Wheat Ale. Speaking of, if you find a taproom that has Watermelon Wheat on tap still, do everyone a favor and drink a pint. The sooner they finish those kegs, the sooner they'll get the coffee porter on! Finally... while there isn't an official sign up just yet, Chef Aaron Brown from Taco de Paco and I will be doing another Pop-Up Beer Dinner at the Tin Roof Brewery on Thursday, November 29th. This one will be titled "Louisiana Re-Imagined," and the Coffee Porter will, of course, be featured. If you are interested in attending, please email me at jay@biteandbooze.com and I'll be sure to let you know as soon as the Eventbrite page has launched!